The cold water breaks and points West Coast Canada (British Columbia) offer some of the best potential in the country. Whilst the east coast of Canada boasts it’s own hardened Atlantic crew and culture, it is the cold water breaks and points of West Coast Canada (British Columbia) that offer some of the best potential in the country. In particular, Vancouver Island which sits just off the coast and in full fire of any descending NW Pacific bombs signals your best bet to score a wave in Canada. The capital of Vancouver Island is Victoria, just to the south and an easy ferry ride or flight from Vancouver. Victoria stands with Melbourne and Sydney as three of the great Victorian architecture cities on earth. As you walk these streets you’ll be reminded of home...until someone shouts out “take off hosehead” that is. Grab a car and head up the west coast of the island. It’s not hard to find surf here. Throughout Dec to March you’ll usually be waiting for it to die down. During these times, seek out the novelty bays and enclosed river mouths of the far south, places like Jordan River with locals that would make even a North Narra clubby blush in their colourful language and descriptors for visiting surfers. Only a few hours north you’ll find the peaceful town of Tofino. It’s often best to book in advance as their is a limited selection of accommodation on offer. The town is well set up for surf tourism however and you will be welcomed. Tofino rests on a neck of land called the Ucluelet Peninsula – an east to west running strip with Tofino to the left and 35 kilometres to the right lies Ucluelet. The entire stretch is a collection of points and reefs offering something from beginner through to advanced level. 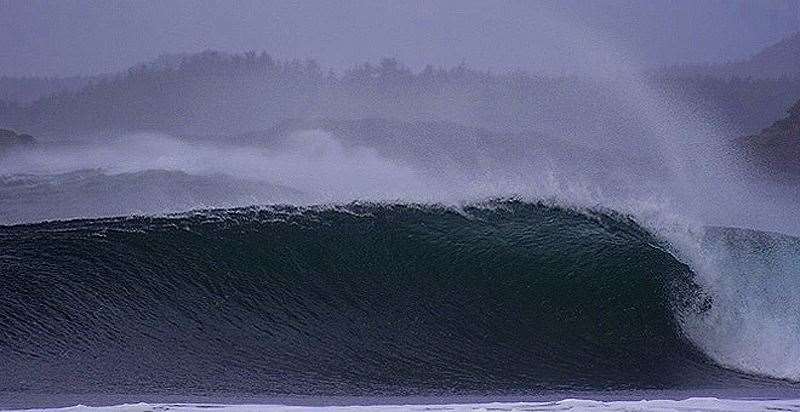 Base yourself in Tofino and hook up with one of the camps – they’ll show you what you need to see in the area to match your own level and needs. Most of the reef breaks are notoriously hard to find, many requiring boat access and almost all of them sensitive to the large tidal range (up to 5 metres) - you’ll save a lot of time working with someone that knows the area. Like all top shelf surf destinations, it’s only ever a matter of time before the rest of the word discovers them. The ASP rolls into town in October for the Cold Water Classic and whilst crowding isn’t a problem due to the range of breaks in the area, accommodation can be tricky unless you have booked well in advance. With overcrowding never really a problem in bona fide cold water destinations such as this, it's only a matter of time before they start replacing some of the overcrowded tropical destinations on our annual surf trip schedule in the future. It’s easy to feel welcomed in BC, the locals speak English on this coast, albeit with a ridiculous accent. The money is made of plastic and some of it even has the Queen on it just to make you feel at home. September to March is your prime window here. The early in the season the better as far as water comfort goes. After September (12 degrees) the water temperature falls sharply and bottoms out just above zero in March. Early season will see you getting away with a 4/3 and booties but you will need serious gear to cope with the deep winter. Some of the locals surf year round and manage to fight through with 7mm suits. Depending on how much rubber you are used to wearing you may want to add a few inches to your board selection. Bring something longer for the points and river mouths that work for longer periods with the tides. Plenty of ledges and reefs to surf as well but your window will only be an hour of two each day before the tide makes them too unstable. Tofino is a cracking surf town – think Torquay 20 years ago. There are some great surf shops here to stock up on gear if you need it. Most of the shapers in the area cater more to big guy shortboards / mini mals which suits the points and rivermouths, plenty of Californian shapes available as well. If your looking for reefs and ledges you’ll be very happy with the Hawaiian shapes on offer too – epoxy models more popular due to the increased buoyancy versus wearing more wetsuit deal. Bring your mid length, cold water wax and everything you own made of rubber and your in for a ride.